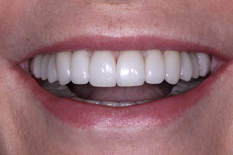 It's hard to imagine that anyone as accomplished as Mary Spillane -- Britain's top Image Consultant -- who radiates confidence and a can-do attitude might need help for her long-time dental problems, but that's just how we came to meet her. With an MA from Harvard and an MSc from Simmons, Mary founded Colour Me Beautiful (a global fashion/beauty franchise with a network of over 1000 studios); was a partner at Whitehead Mann (an executive search and leadership consultancy), and has an enormously successful career as a high-level coach for executives who benefit from her personal development and branding savvy. Her clients have come from Pfizer, Deloitte, UBS, the Disney Corporation, and dozens of Fortune 500 corporations. Despite her busy schedule, Mary has found time to write seven books--her most recent: Branding Yourself: How to Look, Sound, and Behave Your Way to Success. 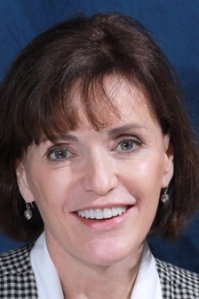 Yet, even with her cheerful personality and radiant health (she's an avid cyclist), Mary realized it was high time to attend to her dental problems and bring her oral health into line with her positive lifestyle. Because Mary's sister had been a patient of ours for a smile makeover; her enthusiasm for the results was exactly the motivation Mary needed to come all the way from London for a consult. Mary's energy was contagious, and we set to work immediately. We could see that Mary's teeth had been shortened by years of wear and tear from grinding---reducing the lower third of her face and aging her prematurely. 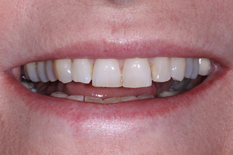 We decided to correct and reestablish her bite with a complete set of veneers and porcelain overlays to regain the optimum height for her teeth, and to replace the sections that had been ground away.